With a stay at Embrace Calistoga in Calistoga, you'll be a 5-minute drive from Old Faithful Geyser of California and 8 minutes from Sterling Vineyards. Featured amenities include complimentary newspapers in the lobby, luggage storage, and an elevator (lift). Free self parking is available onsite. With a stay at Hotel St. Helena in St. Helena, you'll be a 3-minute drive from Culinary Institute of America and 6 minutes from V. Sattui. Free self parking is available onsite. 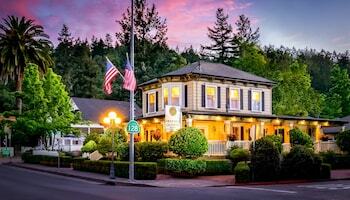 Located in Calistoga, Hotel D'amici is minutes from Calistoga Visitors Center and Calistoga Hot Springs. Free self parking is available onsite. With a stay at Fanny's in Calistoga, you'll be a 4-minute drive from Old Faithful Geyser of California and 8 minutes from Petrified Forest. Free self parking is available onsite. With a stay at this cabin in Calistoga, you'll be within a 10-minute drive of Old Faithful Geyser of California and Storybook Mountain Vineyards.